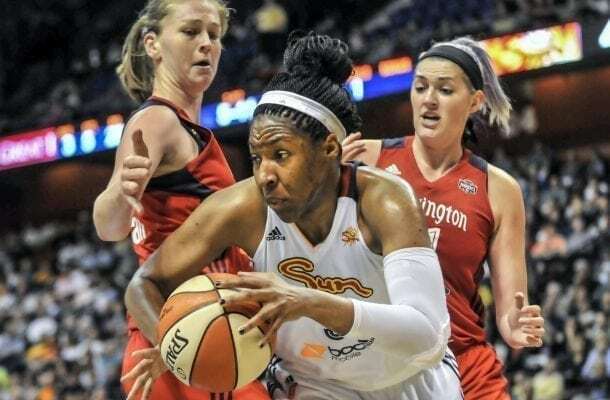 The Washington Mystics travel north to take on the Connecticut Sun in this WNBA battle on Tuesday, July 24, 2018. This is a huge battle as these two teams are separated by just 1.5 games and standings. When the Washington Mystics take on the Connecticut Sun on Tuesday, a whole lot will be on the line. Both of these teams are battling for a playoff position, as Connecticut finds themselves five games out of first and two games out of fourth, while Washington is 3.5 games out of first and a half game out of fourth. Neither team has any room for error, so this game could very well have a playoff atmosphere to it. Washington enters this contest 14-10 on the season. They are 6-5 on the road and are 5-5 in their last 10 games. The Mystics are an impressive 10-3 in the conference this season, tied for the best conference record in the WNBA. Washington is averaging 84.8 points per contest while shooting 44.3 percent from the field and 35.6 percent from beyond the three-point arc. Meanwhile, opponents are scoring 82.3 points per game against the Mystics. Opponents are averaging 45.4 percent from the field and 34.5 percent from three-point range. Washington is led by Elena Delle Donne, who is averaging 20.5 points per game, third best in the WNBA. She is also averaging 7.4 rebounds per contest, which is ninth in the league. She has clearly established herself as an MVP candidate. Kristi Toliver is second in scoring average on the team at 14.0 per contest and Ariel Atkins is third at 11.5. This is one of the most talented starting fives in the league. LaToya Sanders is averaging 9.9 points per game and is second at 5.9 rebounds per contest. Connecticut is 6-4 at home the season and they are 6-6 in the conference. In their last 10 games, the Sun are 4-6. Connecticut is averaging 85.4 points per contest while yielding 81.6 points per game to opponents. They are shooting 45.0 percent from the field and 35.3 percent from the arc. Opponents have put up comparable numbers, averaging 44.1 percent from the field and 35.4 percent from three-point range. Washington is led by a quartet of talented young ladies, beginning with ChineyOgwumike, who leads the team with 14.9 points per contest and 7.5 rebounds per game. Courtney Williams is second on the team in points at 12.5 with Jasmine Thomas third at 12.0 points per contest. Alyssa Thomas is putting up solid numbers as well, averaging 10.5 points per game while leading the team with 9.2 rebounds per contest she also leads the Sun in assists per game at 4.5. Mystics are 10-3 in their last 13 Tuesday games against the spread. Mystics are 8-3-1 in their last 12 road games against the spread. Mystics are 7-3 in their last 10 Eastern Conference games against the spread. Mystics are 1-3-1 in their last five games against the spread when facing a team with a winning record. Sun are 2-6 in their last eight games against the spread. Sun are 3-9 in their last 12 games against the spread against a team with a winning record. Sun are 0-4 in their last four home games against spread. Mystics are 2-5 in the last seven meetings between these two teams against the spread, and the total has gone over in each of the last five meetings in Connecticut. Both of these teams need a victory, but it likely means more to Connecticut because they are trailing and are at home. Washington has not fared well in this series, so take the Sun to win, 90-83.